Discussions Magazine Music Blog: An EXCLUSIVE interview with TAPES 'N TAPES! An EXCLUSIVE interview with TAPES 'N TAPES! Sometimes it’s good to be an outsider. Just look at Tapes ‘N Tapes. This Minneapolis outfit released their first EP in 2004 and their debut full-length album, The Loon, in 2005, both on their own Ibid Records label. While the band expected to sell to their faithful followers in their hometown, nothing prepared them for what happened next. Once The Loon hit the streets, they became one of the most blogged about bands on the internet. Seemingly overnight, this band of outsiders were pushed into the spotlight and became darlings of the Alt-Rock, College and Indie scenes. XL Recordings signed the band up and reissued The Loon in 2006, giving it better distribution and putting it into the hands of those that couldn’t find the original version. Two years later, the band released Walk It Off, another fine album that was met with accolades and acclaim. With their contract expiring after two albums, Tapes ‘N Tapes left XL and went about re-launching Ibid and recording their third album themselves. The results can be found on the album Outside , which is officially released on January 11th, 2011. While still retaining their unique sound, Outside also shows a maturity on all levels. This is a band that has grown with each release, improved with each tour but has never lost sight of the joy of making music. Tapes ‘N Tapes just keep getting better ‘n better. 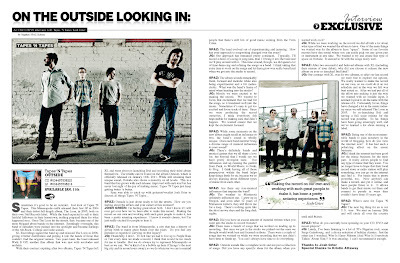 SPAZ: Outside is just about ready to hit the streets. How are you feeling about the album and your career at this moment? JOSH GRIER: I’m feeling great about both. I don’t know if I will ever get over how we’ve been able to make this record. Making the record on our own and working with such great people to make it, has been a pretty amazing experience. I know it sounds cheesy, but I’m just really excited for people to hear it. SPAZ: The band is from Minneapolis, a city that has a history of giving birth to many great bands over the years. Do you feel any pressure in regards to carrying on that legacy? JG: Thankfully, I don’t. If I felt like we had to live up to Purple Rain or Tim every time we made a record, I think that would be too much for me to handle. But we do always try to represent Minneapolis as best as we can. We’re kind of in a bubble up here (Chicago’s the next big city and its seven hours away), so we do whatever we can to remind people that there’s still lots of good music coming from the Twin Cities. SPAZ: The band evolved out of experimenting and jamming. How has your approach to songwriting changed over the years? JG: Our approach has remained pretty consistent. Typically, I’ll record a demo of a song or song idea, than I’ll bring it into the band and we’ll play around with it. This time around, though, we did spend a lot of time demo-ing and refining the songs as a band. I think taking that extra time to work on the songs and let them grow was really beneficial when we got into the studio to record. SPAZ: The album sounds remarkably fresh, focused and melodic while also being experimental and a bit melancholic. What was the band’s frame of mind when heading into the studio? JG: Mostly we were excited to be making the record. We wanted to focus that excitement that we had for the songs, so it translated well into the music. Sometimes it’s easy to get too excited and loose track of time. Since we were producing the record ourselves, I think everybody felt responsible for making sure that didn’t happen. We wanted ensure that we kept the excitement focused. SPAZ: While some moments on the new album might recall an influence or two, the band’s sound is wholly unique. Does each band member bring a diverse range of musical influences to your sound? JG: There’s definitely bands and musical genres that we all share a love for, but beyond that I would say we have pretty divergent taste. Our influences end up running the gambit from Punk, to World Music, to Funk, to Prog. I think having all of those perspectives within the band helps keep things fresh for us, because we‘re always learning about different types of music from each other. SPAZ: Are there any non-musical influences that inspires the band? JG: The weather in Minnesota definitely influences me. I grew up in Oregon, and even after 12 years of Minnesota winters, they still throw me for a loop. There’s nothing quite like the short snowy days and the long dark nights. SPAZ: Did you have an excess amount of material written when you went into the studio to record Outside? JG: There were a bunch of songs that we worked on leading up to recording. But once we got in the studio we picked out the ones we thought would work best and focused on those. There were a couple of songs that we worked on while we were recording that we just didn’t have time to finish up. You can’t always have time to do everything. 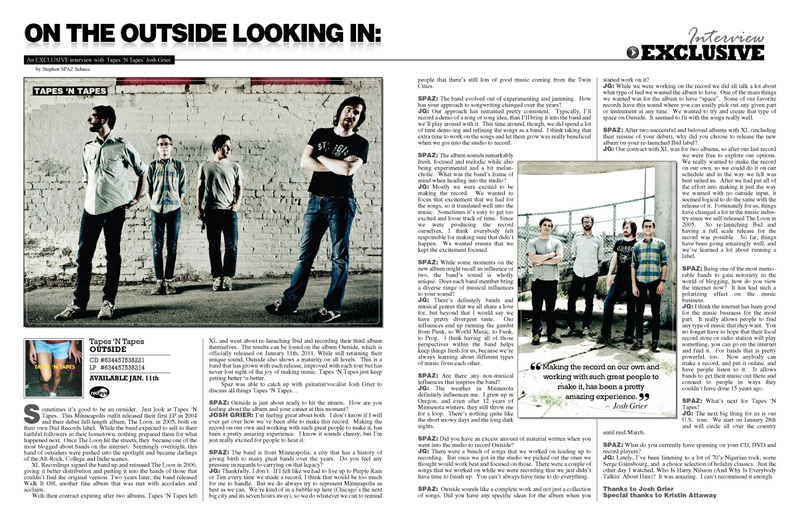 SPAZ: Outside sounds like a complete work and not just a collection of songs. Did you have any specific ideas for the album when you started work on it? JG: While we were working on the record we did all talk a lot about what type of feel we wanted the album to have. One of the main things we wanted was for the album to have “space”. Some of our favorite records have this sound where you can easily pick out any given part or instrument at any time. We wanted to try and create that type of space on Outside. It seemed to fit with the songs really well. SPAZ: After two successful and beloved albums with XL (including their reissue of your debut), why did you choose to release the new album on your re-launched Ibid label? JG: Our contract with XL was for two albums, so after our last record we were free to explore our options. We really wanted to make the record on our own, so we could do it on our schedule and in the way we felt was best suited us. After we had put all of the effort into making it just the way we wanted with no outside input, it seemed logical to do the same with the release of it. Fortunately for us, things have changed a lot in the music industry since we self-released The Loon in 2005. So re-launching Ibid and having a full scale release for the record was possible. So far, things have been going amazingly well, and we’ve learned a lot about running a label. SPAZ: Being one of the most memorable bands to gain notoriety in the world of blogging, how do you view the internet now? It has had such a polarizing effect on the music business. JG: I think the internet has been good for the music business for the most part. It really allows people to find any type of music that they want. You no longer have to hope that their local record store or radio station will play something, you can go on the internet and find it. For bands that is pretty powerful, too. Now anybody can make a record, and put it online, and have people listen to it. It allows bands to get their music out there and connect to people in ways they couldn’t have done 15 years ago. SPAZ: What’s next for Tapes ‘N Tapes? JG: The next big thing for us is our U.S. tour. We start on January 28th and will circle all over the country until mid-March. SPAZ: What do you currently have spinning on your CD, DVD and record players? JG: Lately, I’ve been listening to a lot of 70’s Nigerian rock, some Serge Gainsbourg, and a choice selection of holiday classics. Just the other day I watched, Who Is Harry Nilsson (And Why Is Everybody Talkin’ About Him)? It was amazing. I can’t recommend it enough.